Please enter the name exactly as you want on your clip as well as which font you prefer. Example: McKenna, MCKENNA, mckenna - font #8. Thank you! Personalized Baby Police Giftset. Perfect giftset for the little police one in your life. 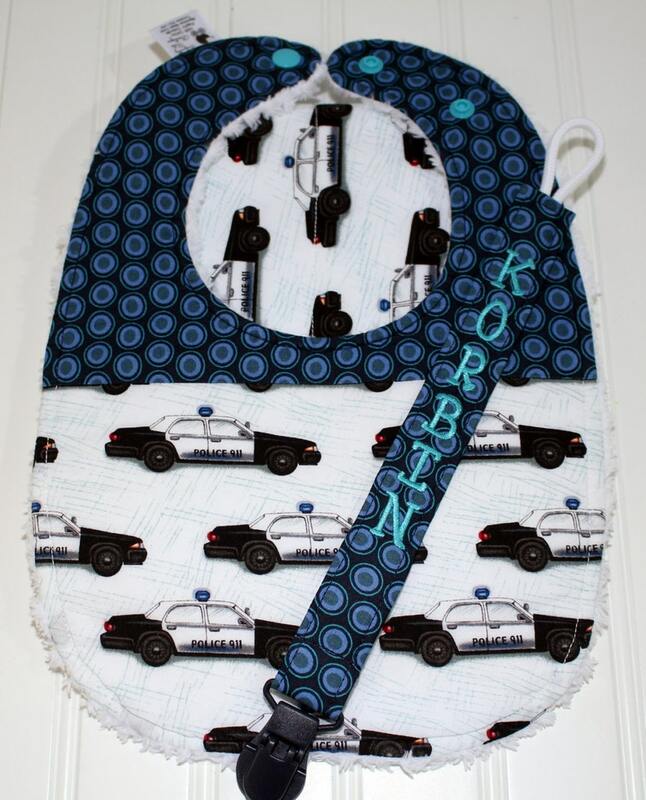 Bib and Burp Cloth features little police cars. Personalized Pacifier Clip. Please indicate in notes to seller the name you would like for your personalization. Infantly Cute now offers a gift box set of our cutest accessories for all your little ones needs! Our sets includes one bib, one burp cloth and one Pacifer/Toy Clip. All of these products are made with 100% high quality cotton materials. We package our gifts sets in a clear acrylic gift box, perfect for gift giving.